Why is discarding old hard drives dangerous? It’s always exciting to upgrade your computer systems—whether your entire network or just a few outdated PCs. And while it’s likely you’ve taken steps to remove sensitive information from your old hard drives, the reality is that unless they’ve been properly destroyed, you could be revealing confidential data without even realizing it. According to Simson L. Garfinkel, Computer Forensics Expert and Post Doctoral Fellow at the Center for Research on Computation and Society at Harvard University, it’s not uncommon for organizations to simply throw out or giveaway old computers and hard drives that contain things like stored credit card numbers for customers, private medical records, financial records and other highly personal information. In a study Garfinkel conducted, he purchased over 150 hard drives via swap meets, online auction sites, used computer shops and other sources. And, after close review, each one of them contained reams of personal information that identity thieves and other unscrupulous characters could have easily obtained. Interestingly enough, when contacted, the organizations to which these hard drives belonged were shocked to discover that their computers weren’t properly destroyed. Many companies spend time training employees to delete sensitive data on hard drives before the machines leave the building—the problem is that erasing data doesn’t always eradicate it. The fact is, hackers and identity thieves are often able to recover deleted files that are still stored on your computer, even if you’re unable to see or access them yourself. So even if you think you’ve wiped your drive, it’s very possible that you’ve left data that you wouldn’t want to fall into the wrong hands. It’s not unheard of for old hard drives to end up in the garbage dumpster behind a building, but this is the last place you should be discarding them. Although it may seem like a long shot that anyone would find them, or even be looking in the garbage dumpster, the fact is, dumpster diving is becoming more and more common. The only way to ensure your hard drives cannot be a source of information for data breaches is through a secure data destruction process. 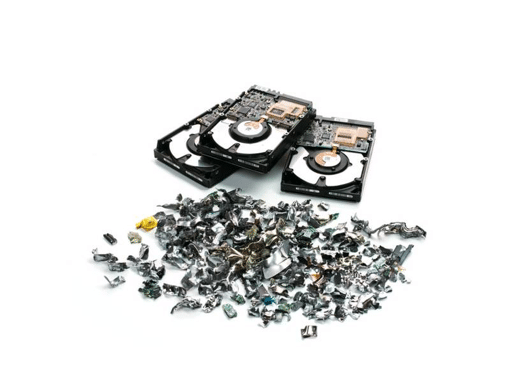 The process, which should be performed by a provider who is NAID AAA certified, involves physically destroying each hard drive using specialized equipment that can handle desktop and laptop computer hard drives. In addition, your provider should offer onsite and offsite destruction managed by a crew that is rigorously trained and security screened. When it’s time to upgrade your computers, turn to All Points Mobile Shredding to handle the destruction of your old hard drives. Our trucks are equipped with the most advanced machinery and will quickly and permanently destroy all your drives, ensuring your data cannot be comprised. We also provide you with a certificate of destruction for your records, an important step to remaining compliant with industry regulations. Find out more about our Mobile Shredding services by calling 772.283.4152.